There are plenty of things that make a master bathroom special, but none are quite as important as the vanity. Acting as a centerpiece, a modern bathroom vanity can completely uplift the room and turn it from boring to beautiful in an instant. With that in mind, deciding on the right one for your particular home can be challenging. Based on your personal preferences, you can choose whether you want a master bathroom vanity that is attached directly to the wall or one that rests on the ground, one or two sinks and wood, quartz or other materials. You can also decide based on length, although it is most appropriate to choose a 50” and above piece for a master bathroom. To help you narrow down your search, we’ve put together a list of three of our best modern bathroom vanities that go perfectly in any bathroom. 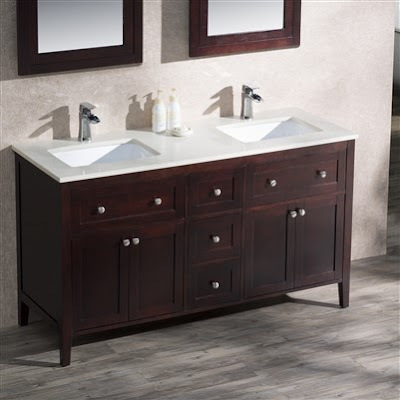 The Adams vanity is one of our best sellers, known for its modern design, clean-cut edges and symmetrical storage. Unlike some vanities, this one floats above the floor, giving it a unique, minimalist look. Your guests will be amazed at the design and are sure to send compliments your way! Once you’ve decided the Vanity Adams is right for you, all you have to do is choose the color and size. This particular model measures 72” x 22.25” x 20.75”, but you can choose several different sizes in order to achieve the right dimensions for your space. 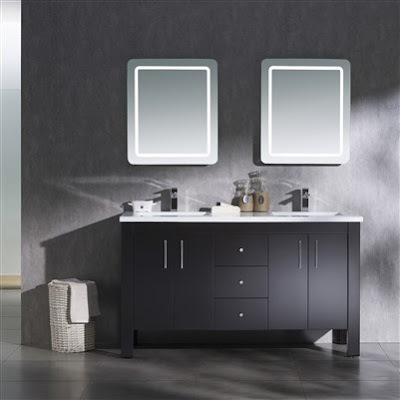 This vanity is available in three different tones: espresso, metal gray and matte white finish. It comes with a solid surface counter top made out of polyester resin and aluminum hydroxide powder, with an integrated basin in matte white. All in all, the Vanity Adams model is an excellent choice for homeowners who are looking to modernize their space and create a unique, never-before-seen bathroom! Vanity Victoria is the perfect blend of classical and contemporary. It features a modern counter top and symmetrical design, but unlike the Adam, it includes several traditional features such as the cabinets and knobs. It also comes with angled legs, an added detail that guests and family members will appreciate. In addition to its charming appeal, it has high functionality. The Vanity Victoria has ample storage space, including three drawers near the top for convenience and efficiency. All of your everyday toiletries can easily be accessed through these drawers, all while remaining discrete enough to remain beautiful. You can buy the Vanity Victoria in dark walnut, espresso and matte white finish. With its solid wood construction, quartz stone top and soft close doors and drawers, this makes a wonderful addition to your simple but elegant bathroom. The Parson vanity collection combines the wonderful aspects of both the Adam and the Victoria, in order to create a versatile style that fits into both traditional and contemporary homes. On the modern side of things, it boasts a simple and symmetrical design, giving it a refreshingly clean and understated look. On the other side, the square-pegged legs and storage space add a traditional appeal. All together, these features create a well-rounded modern master bathroom vanity that our customers love! The Vanity Parsons has several drawers and cabinets for maximum storage potential, as well as a durable wood frame. Available with a solid surface counter and integrated basin, you can choose between dark walnut, chestnut, espresso and matte finish for a warm, inviting bathroom vanity. These modern vanities encompass all of the modern qualities that so many homeowners strive to achieve. 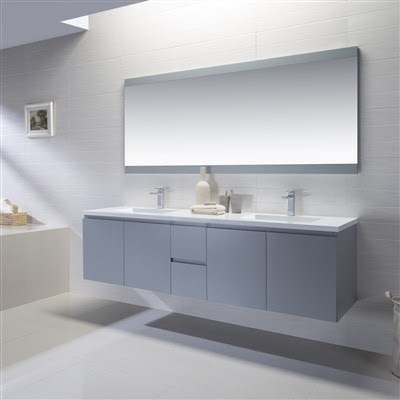 Whether you’re looking to remodel your bathroom completely, replace your vanity or add something new, Bathroom Place is your destination for elegant large vanities. Shop our complete selection to see more wonderful models such as the ones listed above, as well as sink and faucet additions.